Atari 2600 CE - Detals: How does an Atari Work? The highlighted item is the cartridge connector. The cartridge connector is a 24 pin female card edge connector (12 pins on a side) that is connected to power, ground, and the address and data buses of the big 3 chips. 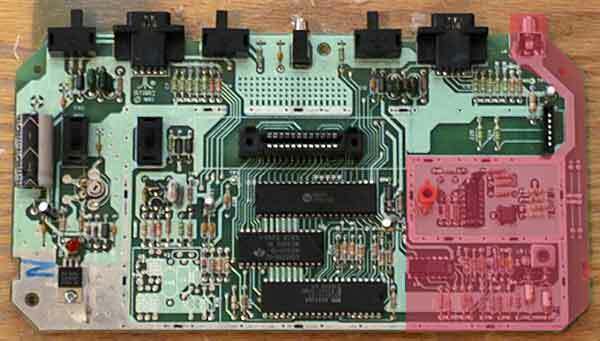 The controller ports and related coponents are highlighted here. The controller ports are 9 pin D-sub connectors, and the resistors and capacitors associtade with them help with the correct amount of power, as well as protecting the lines from noise and feedback. From here the signal lines travel to both the RIOT and Stella chips. This is the power circuit. It normally takes 9 Volts DC from the power supply, then knocks it down to 5 volts that the console uses. Technically, the power circuit can take anywhere from 6 to 35 volts (the voltage regulator can handle that much) but it's not recommended. The color reference circuit takes both 5 and 9 volts and, using a potentiometer (variable resistor) sends a baseline voltage level to pin 10 on the Stella. The Stella uses this voltage as a reference for the luma signals, which then affects the color of the resulting image. The potentiometer (pot) allows the factory or service personel to tweak the color output to an "ideal" balance. The heart of the Atari and former bane of my project, the clock circuit. Like modern computers, all three chips require a clock signal to drive them. What's used in the Atari is a 3.579545 MHz crystal, which matches the frequency of the NTSC signal. The tricky bit is that the crystal generates the oscillation, but the electrical signals are not discrete - the rest of the circuit helps make the clock pulse more distinct. This clock circuit is in most VCRs, DVD players, and TVs (and just about anyhting else that interfaces with a TV), which enabled me to find an alternate circuit schematic that I had better success with. The RIOT chip - a 6532 IO processor with 128 Bytes of RAM! A very small amount indeed, but clever programmers can use it for a vast array of information. The RIOT is primarily responsible for reading the cartridge, controller, and switch information - though the Stella handles the paddles and fire buttons. The RIOT is housed in a 40 pin Dual Inline Package (DIP). The 6507 CPU. A slimmed down, less expensive (at the time) version of the ubiquitous 6502 processor, which has been used in the Commodore 64, Apple II series, and Furbys. Yep, the 6502 is extremely flexible -aren't you glad it's the brain of the Atari VCS? The CPU is a 28 pin DIP packaged chip. Ah, the Stella Tellevision Interface Chip (TIA) - named after an employee's bicycle - not a female employee - the Stella chip is responsible for creating the sights and sounds of your fvorite (and not-so-favorit) Atari games. As mentioned before, the paddle and fire buttons are also attached to the Stella. The Stella is a 40 pin DIP packaged chip. This is the entire Audio/Video (A/V) subsystem. Signals from the Stella are manipulated and combined, then sent to the RF modulator so that they can be "tuned in" on channel 3 or 4 of any TV. Finally, the RF modulator. Responsible for making the A/V signal look like a "tunable" channel to any TV. Okay, there is one very important thing to remember about how the Atari 2600 draws to the screen, which is different from just about any other console, or even modern computers - The Stella chip doesn't have any video RAM. What does that mean? It means that the programmer is responsible for drawing to the Stella at the same time that it's drawing to the screen! This complicates things, but also allows for some interesting trickery. For the purposes of Stella programming, a single television frame consists of 262 horizontal lines, and each line is divided by 228 clock counts (3.58MHz). The actual TV picture is drawn line by line from the top down 60 times a second, and actaully consists of only a portion of the entire frame (see diag. #1). A typical frame will consists of 3 vertical sync (VSYNC) lines*, 37 vertical blank (VBLANK) lines, 192 TV picture lines, and 30 overscan lines. Ataris research has shown that this pattern will work on all types of TV sets. Each scan lines starts with 68 clock counts of horizontal blank (not seen on the TV screen) followed by 160 clock counts to fully scan one line of TV picture. When the electron beam reaches the end of a scan line, it returns to the left side of the screen, waits for the 68 horizontal blank clock counts, and proceeds to draw the next line below. All horizontal timing is taken care of by hardware, but the microprocessor must manually control vertical timing to signal the start of the next frame. When the last line of the previous frame is detected, the microprocessor must generate 3 lines of VSYNC, 37 lines of VBLANK, 192 lines of actual TV picture, and 30 lines of overscan. Fortunately, both VSYNC and VBLANK can simply be turned on and off at the appropriate times, freeing the microprocessor for other activities during their execution. The actual TV picture is drawn one line at a time by having the microprocessor enter the data for that line into the Television Interface Adaptor (TIA) chip, which then converts the data into video signals. The TIA can only have data in it that pertains to the line being currently drawn, so the microprocessor must be one step ahead of the electron beam on each line. Since one microprocessor machine cycle occurs every 3 clock counts, the programmer has only 76 machine cycles per line (228/3 = 76) to construct the actual picture (actually less because the microprocessor must be ahead of the raster). To allow more time for the software, it is customary (but not required) to update the TIA every two scan lines. The portion of the program that constructs this TV picture is referred to as the Kernel, as it is the essence or kernel of the game. In general, the remaining 70 scan lines (3 for VSYNC, 37 for VBLANK, and 30 for overscan) will provides 5,320 machine cycles (70 lines x 76 machine cycles) for housekeeping and game logic. Such activities as calculating the new position of a player, updating the score, and checking for new inputs are typically done during this time. So, knowing this, we can explain why many games have those little black lines on the left side of the screen: the programmers needed a few extra clock cycles to change colors of the player or background - which is why those little black lines normally show up on color transitions! Maybe they won't be quite so annoying now that you know they make 2600 games more colorful! So, that about wraps it up! If you have any questions, please let me know, I'd love to add to these pages and answer them!